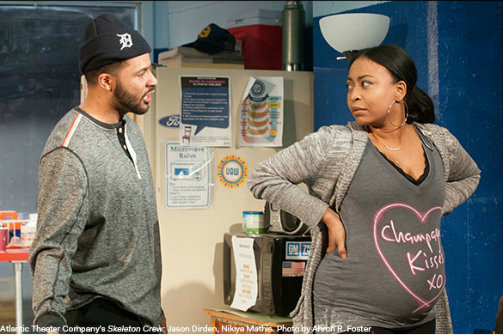 The third play in Dominique Morriseau's "Detroit Trilogy"
Jason Dirden and Nikiya Mathis in Skeleton Crew. Photo by Ahron R. Foster. BOTTOM LINE: Skeleton Crew is a poignant and effective conclusion to Dominique Morisseau's Detroit trilogy thanks to its smart script and tremendous actors. Dominique Morisseau closes out her Detroit trilogy with the big-hearted and quietly moving Skeleton Crew. Set in the Motor City around 2008, Morisseau's drama is a testament to the ordinary lives that shaped the city's mechanical golden age that must now cope with its hastening degradation. The way each of the four characters handle this shift—eeking out their lives through an assembly line's minute tasks—is where Skeleton Crew finds its greatest life. 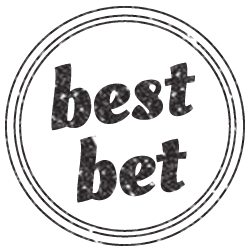 The action takes place in the manufacturing company’s break room, realistically designed with Michael Carnahan’s thoughtful care. Its inhabitants, Faye (Lynda Gravatt), Dez (Jason Dirden), and Shanita (Nikiya Mathis), shoot the breeze and ask Reggie the foreman (Wendell B. Franklin) for overtime shifts to make extra money. They talk a great deal—relishing Morisseau’s nimble, authentic dialogue—but listen even more: to the rumors that the plant is closing, to the tightening regulations that upend their jocular habits, and, in the pregnant Shanita’s case, to the humming noises of production, omnipresent beyond the break room walls, which she claims soothe her unborn baby. Mathis brings enormous humor and even more grace to her Shanita. She is naive without being foolish and heartfelt without becoming saccharine, making her a strong foil to Gravatt’s older and wiser Faye, the matriarch of the factory who is about to reach her thirtieth anniversary on the assembly line. Gravatt instills Faye with a stony facade that conceals a tender lining only seen when she stands up for her coworkers’ jobs as rumors of layoffs becomes realities and when she reveals her unfortunate relationship with the products she so dutifully labors to manufacture. Shanita too takes great satisfaction in her dexterity: when revealing how the cars she helps build could be used for a family excursion or a couple’s first time, the irony that her job will soon be obsolete is as uncomfortable as Mathis’ passion is radiant. And the men in the cast are just as gifted. Dirden, as Dez, is simultaneously bombastic and endearing as he vies for Shanita’s attention and brushes off Faye’s guidance as if she were his own mother. Franklin is equally strong as the conflicted foreman Reggie who must choose between supporting the staff he once worked alongside or saving his own job as the factory closing encroaches. The consequences of his actions and how Franklin handles emotional cornerstones of the play make him more than a stereotypical manager wrestling with blue- vs. white-collar ideologies. Morisseau’s ability to flesh out her characters in this way lets her lyrical text soar, and her creation of middle-American employees in humdrum jobs is reminiscent of Annie Baker’s Pulitzer Prize-winner, The Flick. Both works sympathetically portray their characters, and more importantly their communities: Detroit becomes a role as vital as the protagonists in Morisseau’s play. In addition to Detroit, the other symbolic role in Skeleton Crew is the Performer, played by Adesola Osakalumi. Osakalumi, who also choreographed his movements, is a dancer both elastic and mechanical who director Ruben Santiago-Hudson incorporates into the show’s scene transitions to show the monotonous yet splendidly choreographed tasks the workers perform in order to expedite production. Much like the workers who repeat small task after small task, Osakalumi’s dancing highlights the vivacity beneath the workers’ mundane activities, and the resilience, joy, and pride they bring to their professions. Skeleton Crew is written by Dominique Morriseau and directed by Ruben Santiago-Hudson. Set design is by Michael Carnahan. Costume design is by Paul Tazewell. Lighting design is by Rui Rita. Original music and sound is by Robert Kaplowitz. Original songs by Jimmy "J. Keyes" Keys. Production stage manager is Laura Wilson. Choreography is by Adesola Osakalumi. The cast includes Jason Dirden, Wendell B. Franklin, Lynda Gravatt, Nikiya Mathis, and Adesola Osakalumi.